‘And when did you last see your father?’ painting by William Frederick Yeames, 1878, public domain via Wikimedia Commons. William Carnaby of Farnham, Alwinton and Bothal was elected MP for Morpeth again for the Long Parliament in November 1640. He raised forces for the King and was accordingly disabled from attending parliament on 26 August 1642. He was Treasurer of the Army and fought in the Northumberland Regiment, commanded by the Marquess of Newcastle at the Battle of Marston Moor. The family's support of the Royalist cause is cited as the main contributory factor along with their recusancy in their subsequent downfall. ​Just because something is written in history books does not mean it is correct. It should be noted that this is an observation and not a criticism! Many historians and genealogists have done excellent work in laying the foundations for understanding our families past on which we can build. However, as the authors were or are only human they, like us, can only draw conclusions based on the information they have before them, or the sources they chose to consult. The same applies for some of the pedigrees these histories contain. For many researchers they are the first port of call for information, particularly in the pre-census and statutory period. For those trying to piece together earlier generations where non-conformists baptisms and marriage information does not appear in parish registers and is in short supply, these printed pedigrees provide an easy ‘one stop shop’ of seemingly credible information. However, they remain secondary sources. They are not always as reliable as their reputation would suggest which is perfectly illustrated by the case in question. It relates to three branches of the Carnaby family of Northumberland, some of whom were known to be ‘recusants’ or adherents to the Roman Catholic faith. The Carnaby Pedigree which appears on pages 19 – 21 in ‘A history of Northumberland’ Volume 4, published in Newcastle upon Tyne in 1893 is irrefutably incorrect in several details. Most importantly, it is missing a whole generation preceding the marriage of Ralph Carnaby to Ann Dobson at Longhorsley in 1719. Resulting hypotheses drawn from this pedigree are therefore questionable, and researchers of this family are missing a group of descendants that may just provide the link they are seeking. ​The Northumberland History is not alone in making this fundamental error either. Dr Annie Forster whose extensive research into the catholic families of Northumberland in the 1960s, has also failed to spot the missing generation. It is somewhat incredulous that such eminent historians should have either missed the Will of Ralph Carnaby of Todburn dated 25th April 1702, along with annexed inventory and bond, or have chosen to ignore it. Researchers then as now appear to be pre-occupied in establishing links with titled or landowning classes, in this case the armorial family of Carnaby of Halton. By doing so they are missing out on vital information regarding their own family and its place in history. 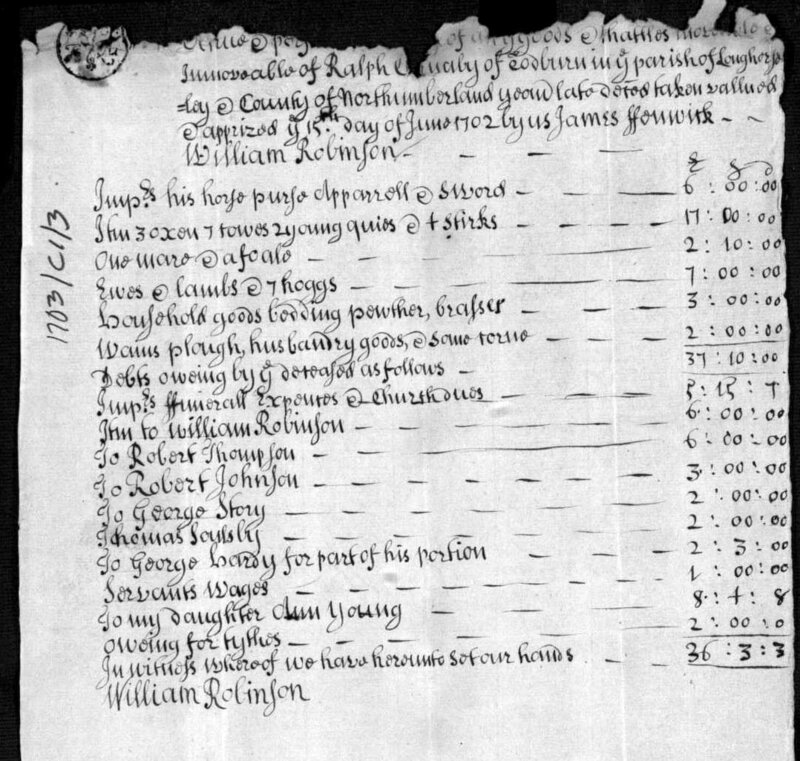 ​The inventory taken shortly after his death (below) is typical of a yeoman farmer of the day with the majority of his moveable wealth being on the hoof rather than in the hand. What is most unusual, however, is the first entry. Whilst it is commonplace to list a horse and apparel, to make the point of itemising a sword is not! Firstly, this Will clearly demonstrates that Ralph Carnaby junior is not the son of Ralph senior, but the son of a Francis Carnaby and his wife Ann. The age of Ralph at his burial in 1763 would suggest a birth date of circa 1695. It is therefore most likely that he is Ralph senior’s grandson, rather than his son as the history would suggest. It is through this line of descent that heritable freehold of lands in Rothbury passed. 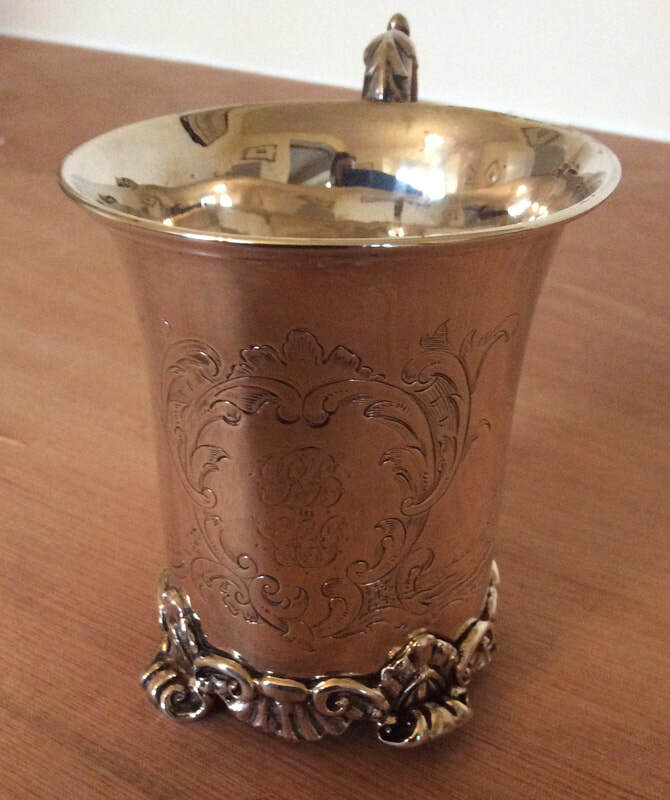 It was still in their possession according to the tithe commutations records of the mid nineteenth century, when ownership passed to the Boak family of Rothbury under the Will of Ralph Carnaby of Shawdon (2x great grandson of the testator) in 1842. Ralph Young is named as a grandson in the above Bond and is also clearly in his minority. 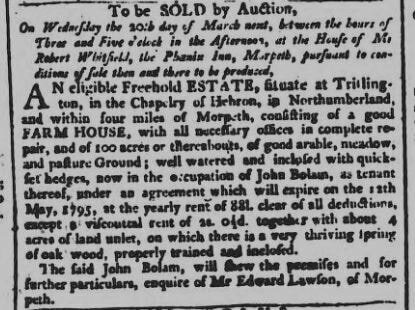 It is to him that his grandfather passes the ‘farm he now enjoys’ which was presumably the tenancy of Todburn. Secondly, the will also confirms that Ralph senior had at least three married daughters viz: Cecily Pringle; Jane Hardy; and Ann Young (see above). The relationship of Ralph and Jane Potts to Ralph Carnaby senior is not given, but when other offspring and their subsequent marriages are taken into consideration there is strong possibility of a further blood connection through a cousin marriage in the next generation. Indeed, there are several other connections that appear to have been missed (even by GAS) that I have traced and are fairly obvious once you get to know the family. Needless to say, this has added approximately a further 30 individuals to the increasingly more complex tree. (To avoid this information appearing publicly elsewhere, incorrectly attributed and without acknowledgement it is available on request only). Iron hilt with large oval plate guard featuring crudely chiseled floral decor and busts of Charles I; integrally forged knuckle bow and side bars screwed to the chiseled ovoid pommel (one detached where it joins the pommel); the side bars joined to the knuckle bow by a pair of diagonal bars. Short scrolled rear quillon; later leather-wrapped grip with twisted wire. Tapering straight single-edged 30 ½" blade with two narrow fullers at the back running nearly the full length; the point rounded. Sword shows much age and wear, as typically found, with pitting and an untouched nearly black patina overall. Common cavalry weapon used by both sides during the English Civil War. Overall length 36 3/4". The Northumberland History claims a relationship existed between the Carnaby family of Hexham and those of Great Tosson and Todburn, citing the Will of Roger Carnaby in 1713 as proof of the familial link. 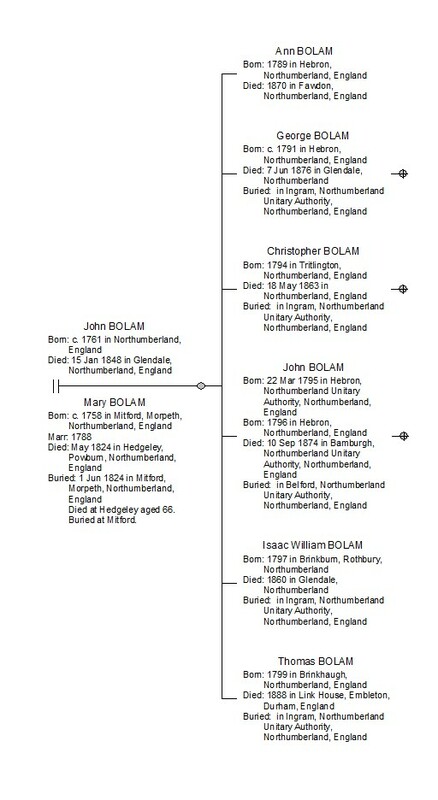 Whilst this Will undoubtedly proves the link between the families of Hexham and Great Tosson, I am struggling to see how and where it verifies a link to the family of Todburn. He had a mortgage on a house at Green Harbour Court, London. His nephew was William Carnaby of Tosson who had a wife named Barbara. He had a niece called Mary (no father named) and a niece called Jane the daughter of his brother Richard. He had a sister in law called Frances who was the wife of Thomas Liddell a Glover in Hexham. He leaves money to a Thomas Beadland of Haggerston but no relationship is given – possibly a servant as it closely followed by a bequest of '£10 to my black boy Wandoe', his present manservant. The surviving Mary of this union who married Lionel Aynsley was not born until 1735. ​It is therefore currently believed that the Mary mentioned in Roger's Will must be another daughter of Richard Carnaby of Great Tosson baptised at Rothbury in 1695, (the most likely - a baptism of another child, Richard, at Rothbury in 1700 has also been missed) or his brother John about whom very little is known other than he had a daughter named Isabella. A familial relationship between the families has not been ruled out but nor, as yet, has it been proved. Roger’s Will of 1713 also provides evidence of trade connections, possibly with the Carolina’s – was Wondoe his black manservant named for the Wando River in South Carolina - and what exactly is meant by the ‘South Seas’? Is this a reference to the ‘South Sea Trading Company’ formed in 1711 which became known as the South Sea Bubble before its collapse in 1720? Certainly the presence of Wando would suggest evidence of Roger’s involvement in the Slave Trade. A bit of digging in the newspapers within the ‘Burney Collection’ uncovered possible evidence of trade with Virginia. ​Plymouth, Jan 8. Yesterday came in here the Hunter of and for London, Roger Carnaby, Master, from Virginia” Daily Courant (London, England), Tuesday, January 12, 1703; Issue 230. 17th-18th Century Burney Collection Newspapers. ​Whilst there is no evidence to confirm this is the one and the same Roger Carnaby it is certainly possible, particularly when it is known he also had a house in London. It is tempting to speculate that Wando was also aboard the shipped that docked in 1703 and was bequeathed £1 for every year of service until Rogers death in 1713, however, without firm evidence, speculation is what it must remain. The above is just an extract from a much larger piece of research, which at present is set to rival if not exceed the 18,000 words of last years Master's dissertation! I must thank Archivist Sue Wood and Paul Ternent of Northumberland Archives at Woodhorn for their assistance thus far, no doubt I shall be imposing myself upon them again in the not too distant future. Forewarned is forearmed as they say! If you are interested in acquiring a copy of this research or indeed would like to contribute to it then please do get in touch. A Why or Quey Stirk was a young cow or heifer. When written in Scots the ‘qu’ is often used in place of a ‘w’. Origin – Danish. Members of the Errington family were also recusants and known Jacobite activists. This particular branch farmed at Old Park, Netherwitton. Appointed plumber at St Mary’s in 1687, undertook leadwork on Tullie House, Abbey St in 1689. Dismissed by St Marys in 1713 for substandard work, reinstated in 1721. Son in 1717 worked on Carlisle Castle Downpipes. Father died 4 Oct 1742 aged 87. His children are mentioned in will of Roger Carnaby of Hexham dated 1713. Descendants of this Carlisle line married daughters of George Hare and Elizabeth Wright of Ingram. 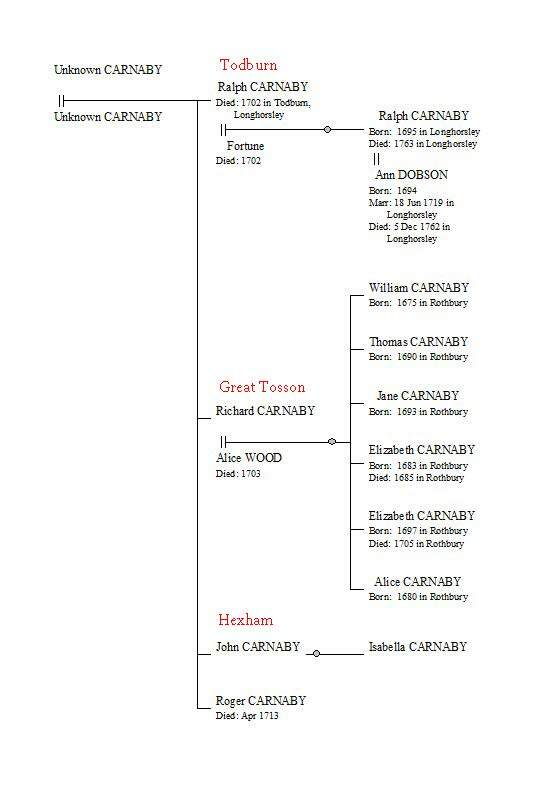 Is this Hare family related to the Hare family that married James Carnaby, Thomas Brewis and Thomas Collin in late 1700s and also potentially linked to the descendants of Francis Carnaby of Todburn? Other information has been drawn from the research of George Aynsley Smith which is held in the family's private Archive. ​I am really enjoying the Beeb’s latest offering the ‘Victorian House’ which delves into the traditional skills and ethos that formed the basis of the ‘Arts & Crafts Movement’ and puts them into practice in the restoration of traditional Victorian country house. 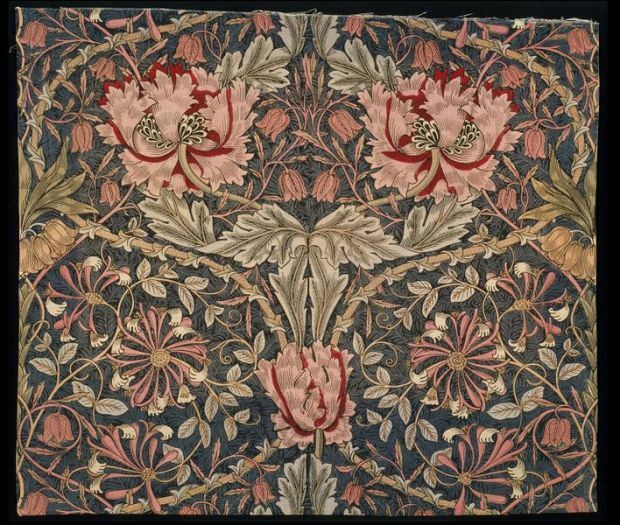 Think of the colours and patterns of William Morris, the art and vision of John Ruskin and iconic stores in London such as Heal’s and Liberty and the picture will start to emerge. ​It ran in my mind that a branch of my own family had been involved in the artistic movement of the age, but unsure as to the extent set off to investigate. What emerged was a family surrounded by artists and artisans who were enmeshed in the social reforms of the late Victorian period to an extent more far-reaching than I had previously realised. Added to this is an interesting back-story of loss and family that has not only been missed by all other family history researchers to date, but where it appears in online trees their history has also been portrayed inaccurately. It appears to be a typical case of records and dates being made to fit without corroborating the evidence. It is a sad fact that if there are 14 trees with the same information and one that dares to be different, human nature is (often mistakenly) drawn to the consensus of opinion. This blog is intended to illustrate how some fairly basic research techniques can help avoid these pitfalls, fill the gaps in knowledge, and to share the parts of this family’s story that appear to have been missed. ​The starting point for this research was my 4th times great aunt Mary Ann Eliza Egerton, the third of 4 children born to 4th great grandfather James Egerton and his wife Alice Spriggins. In Nov 1840 Mary Ann Eliza married artist Henry George Hine at St Marks, Kennington, Surrey. 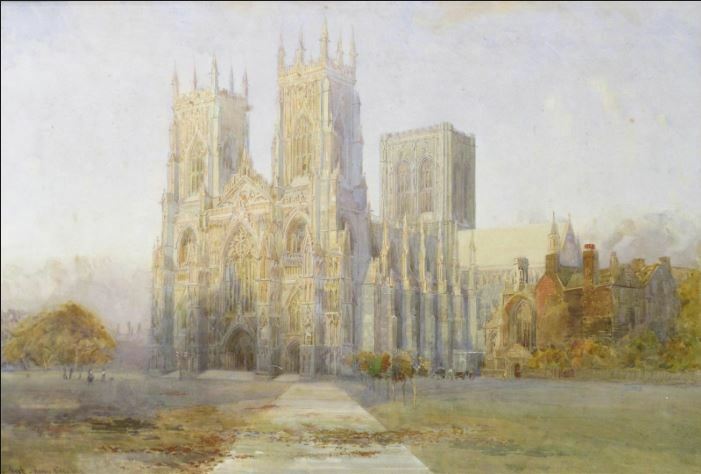 Henry George Hine began his career as an illustrator for Punch magazine but became most well known for his landscape paintings of Sussex and Northumberland. He the son of Hampshire born William Hine who worked his way up from an agricultural labourer to become a Coach Proprietor on the London to Brighton route until his death in 1846. 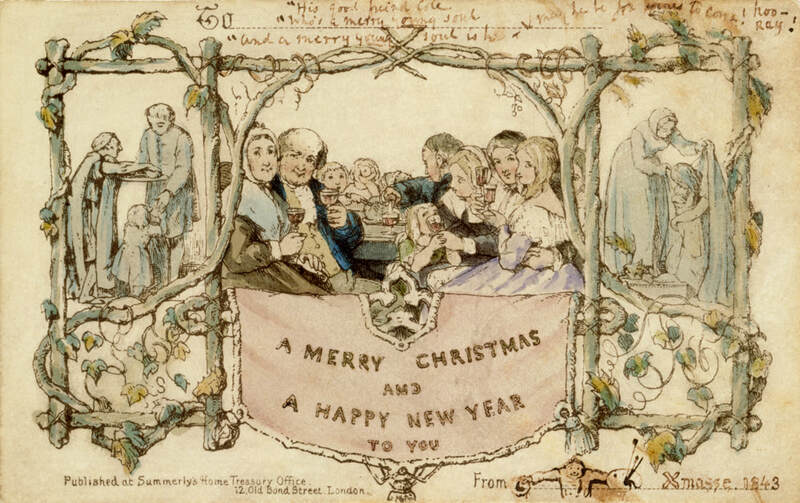 ​Mary Ann Eliza Egerton and her siblings were all christened in London between 1814 and 1826. Although their parents address, and father’s occupation is different each time, family activity prior to these dates appears to be centred round the ancient church of St Giles, Cripplegate, London. 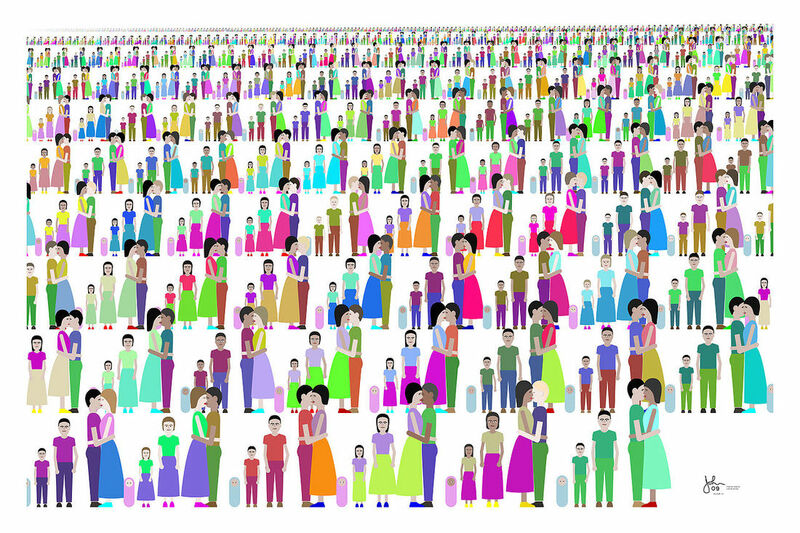 ​Of the 14 online public trees that appear on Ancestry – only 1 has spotted the 4th child! This is probably due to the the age that appears in the transcript attached to her marriage record in 1862 to William Henry Huckwell. Checking the original document it reads ‘age 21 and upward’. This along with the phrase ‘of full age’ is fairly typical of marriage records at this time and should not be taken literally. A simple check of the census records following her marriage confirms her date and place of birth and that her age at marriage was actually 39. 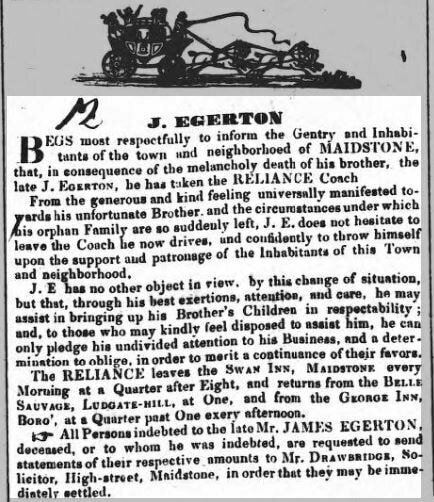 The Egerton children’s father James is recorded as a ‘Trimming Maker’ in 1814, a ‘Boot Maker’ in 1815, a ‘Traveller’ in 1817, but by 1823 he was a ‘Coachman’. By the time of his son James John’s marriage in 1840 his father’s occupation had risen to that of ‘Coach Proprietor’. Of the same 14 online trees 8 give no date of death for James and 6 state it to have been in 1829. This date is wrong – although his demise was still before the advent of Civil Registration, a check of the newspapers graphically describes the tragic circumstances in which his untimely death occurred. 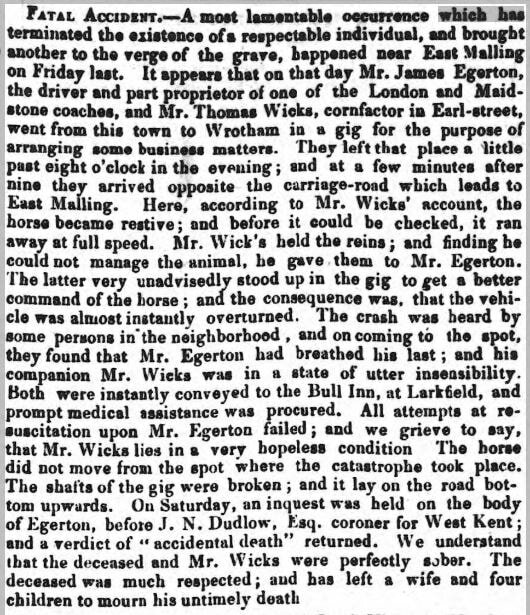 Reproduced courtesy of the British Newspaper Archive; The Maidstone Gazette and Kentish Courier, 10th April 1832. ​James was buried in Maidstone, Kent on 13 April 1832. The above account indicates that in addition to his 4 children James was survived by a wife, although his will, fortuitously written at Maidstone in 1831, makes neither mention nor provision for her. Instead, James entrusts the administration of his estate ‘whatsoever and wheresoever’ to his elder brother John whom he makes both the ‘sole guardian’ of his children and sole executor of his will. This would suggest that papers may have been mistaken, and lets face it, it wouldn’t be the first time! This theory is corroborated by a notice placed by John in the press on 1st May 1832, where he refers to his brother’s children as orphans. Reproduced courtesy of the British Newspaper Archive; The Maidstone Gazette and Kentish Courier, 1 May 1832. ​No death, burial or alternative marriage has been identified for his wife Alice, nor has she been found in subsequent census records. As such, the outside possibility remains that the couple had become estranged. ​James was also survived by his father James Egerton snr, who contrary to popular opinion did not die in 1810 and was not buried at Little Gaddesdon, Hertfordshire! 17 of 18 online trees contain this incorrect information, with the other, also incorrect as it gives the date as 1828. James snr, a Cordwainer (or Shoemaker), described as a Gentleman in his Will also written at Maidstone 14th September 1833, actually died in 1834 and is described of Pollard Row, Bethnal Green! He makes his only surviving son John his sole executor and residual beneficiary after making further bequests of £500 to his daughter Jane Hudson the wife of John Hudson, and £50 to his son in law John Cannee, the husband of his daughter Elizabeth Egerton. In all James Egerton Snr and Lucretia Wood had seven known children all baptised at St Giles, Cripplegate, and possibly an eighth, Susannah baptised at St Giles in May 1776 indicating that Lucretia Wood may have required ‘a big bouquet’ at her marriage the previous September. She is believed to have been named for Lucretia’s mother whose surname was possibly Saunders but this is unverified. ​All the children were baptised at St Giles, Cripplegate, to James Egerton and wife Lucretia. Susannah is the exception in that the father’s name is recorded as John which has subsequently been struck through, but not amended in the original register. Their father's occupation is consistently given as a Cordwainer – or shoemaker. Cordwainers were one of the Livery Guilds of London and produced artisan footwear made from soft kid leather from Cordoba in Spain. The Guild records are housed within the London Metropolitan Archives but have not been consulted as part of this research. Several children including Jane and Elizabeth mentioned above were married at St Lukes, Old Street, as were their parents, which was built to relieve the church of St Giles, Cripplegate, as the population of London expanded in the eighteenth century. ​Six of their children are known to have survived into adulthood. Of Susannah there is no further trace and eldest son Thomas died in infancy and was interred in Spa Fields burying ground Clerkenwell in 1779. Spa Fields would later became the subject of a particularly unsavoury and rather gruesome scandal. Reproduced courtesy of The British Newspaper Archive; The London Illustrated News, March 1845. The ‘Countess of Huntingdon Connexion’, and record set RG4 referenced in Thomas’ burial record may indicate that the family followed at some point at least, the Calvinistic movement within the Methodist Church. This may in part explain the group baptisms of four of the Egerton children at St Giles in 1798. It should also alert the researcher to possible non parish baptisms and references to non conformism in the parish registers for earlier branches of this particular Egerton family. James’ older brother John was also a coach proprietor at the time of his brother’s untimely death. 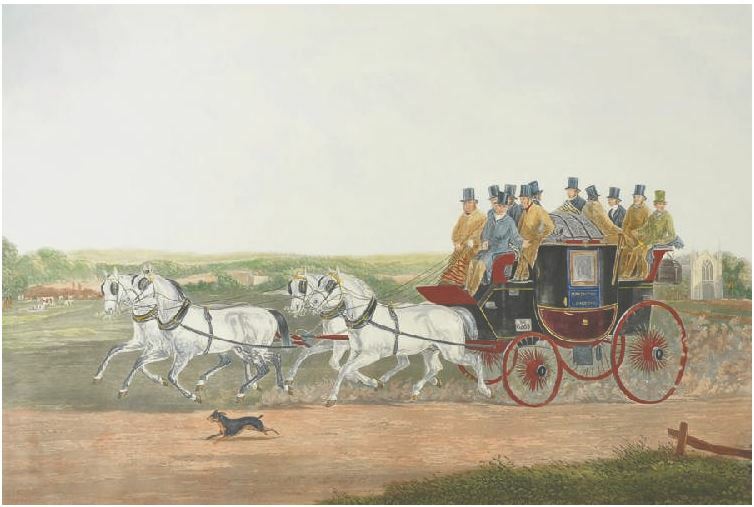 By 1827 he had moved from London to Brighton and was running a coach from the Spread Eagle Inn to Hastings. ​Although he was good to his word and took over his brother’s business, the ‘Reliance’ coach had changed hands by May 1838. 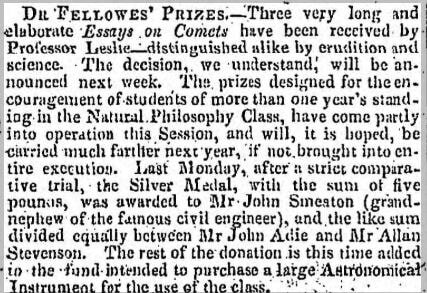 Reproduced courtesy of The British Newspaper Archive; Maidstone Journal and Kentish Advertiser, 29th May 1838. Reproduced courtesy of The British Newspaper Archive; The Brighton Gazette, 7th October 1847. All the children of his brother James Egerton junior’s children, had married before the 1841 census, except for the youngest Elizabeth Caroline, making it difficult to assess the John’s level of involvement in the upbringing of his nephew and nieces. Wiki Commons; Frederick William Woledge, Brighton, the front and the chain pier seen in the distance. ​Although 11 children may be considered a large family even back in the day, it pales into insignificance to her cousin Mary Ann Eliza Egerton, the starting point for this research, who, together with her artist husband Henry George Hine had an eye watering 15 children, 11 of whom survived into adulthood. 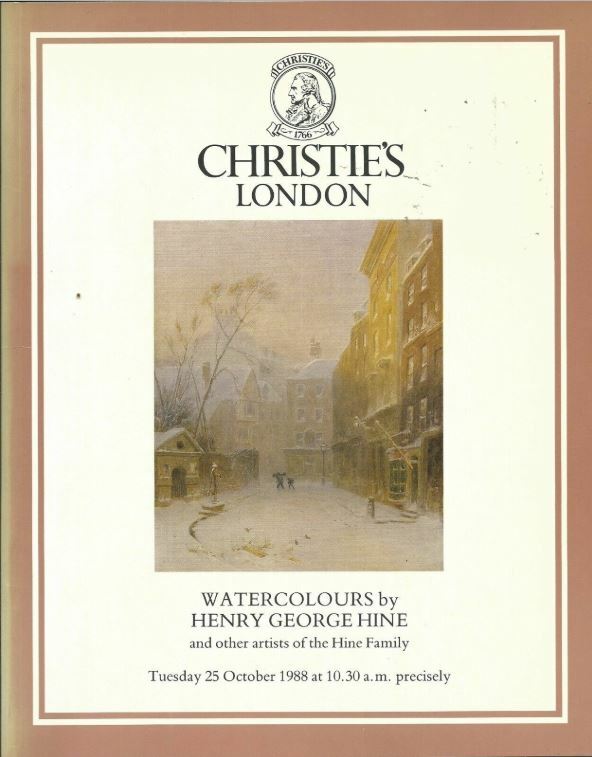 ​Artistic talent was strong in the Hine family to which the 1988 Christie’s Sale Catalogue bears witness, with a total of 81 lots spanning 42 pages, sadly illustrated internally in Black and White. Cover of the 1988 Christies Catalogue of which I have a second hand copy. In terms of the ‘Arts and Crafts’ movement it was their two youngest daughters Ethel and Maude who were the most influential. Although the quotation that the sisters came "on the one side from peasant folk and on the other from old aristocracy" which is uncited, leaves me somewhat rubbing my chin as to it’s origin, there can be no doubt that these two women and their husbands were the driving force behind the establishment and running of the ‘Peasant Arts Society’ based in Haslemere, Surrey. By the time of its inception in 1894-97, Ethel had married artist Godfrey Blount in April 1887, and Maude, Jospeh King, later the same year. The couples together with King’s cousin Greville MacDonald, shunned mass production instead believed in ‘practising their radical beliefs of creating art for ‘love not money’ and restoring ‘country life, its faith and its craft’. 'Winter' one of a set of 4 Coaching Prints by W J Shayer. ​Being a little more serious, none of the sources that I have used to compile the history of this Egerton family and its story requires specialist knowledge or skills. The records used are readily available online. The difference between my research and that of others, is that time has been taken to cross reference the facts, and read the ORIGINAL documents rather than relying on the transcripts. Incorrect information in family trees does in fact have far reaching implications, particularly since the advent, and exponential growth in DNA testing. This is leading folks to believe that as they DNA match others with the same named ancestors in their trees it proves that connection, when in fact the DNA is sometimes pointing to a relationship which is either further back, or, in a different line entirely. I myself have 2 DNA matches out of 12 with hints which suggest a connection to individuals that simply cannot be. This is a problem that I can only see getting worse as more people test and speedily create trees copied from others without verifying the information they contain. ​Christmas is a time of year when many of us gather with friends and family and our thoughts often turn to Christmases past and memories of those who are no longer with us. As the generations pass and living memory fades into oral tradition we family historians turn to researching the lives of our forebears and the times in which they lived in dusty documents, photographs and other more ‘obscure’ sources of information, until we hit that inevitable brick wall. Of these my particular favourites are diaries as they contain a wealth of contextual information as well as familial information. Those such as the ‘Six North Country Diaries’ and the Diary of Archie Simpson 1878, which I plan to fully transcribe and annotate are two fantastic examples spanning a broad range of dates. The latest addition to my collection is ‘The Diaries of William Brewis of Mitford 1833 – 1850’ and for those researching their farming ancestors in Northumberland I would suggest it is essential reading as it covers a period of national and international radical social and political change somewhat resonant of today. ​At what point the knowledge of our heritage fades differs widely – some of us carry unusual names that serve as a reminder. My own ‘Smith’ family has carried the name Aynsley in the male line since 1866 as a reminder of that aspect of our ancestral legacy, and the name Carnaby in the female line to earlier ancestors of that same Aynsley line dates from 1735. Clearly, as the names of these families live on they remain an obvious part of our heritage, but it is often to the exclusion of the many others that make up who we are. ​The diary of William Brewis of Throphill, Mitford 1833 – 1850 stands testimony to how quickly familial connections can be forgotten. He was born at Throphill in 1778 to parents Thomas Brewis and Margaret Hair [Hare]. Through the marriage of his Mother’s sister Ann to James Carnaby, he became 1st cousin to their offspring. Following the tragic death of his cousin Barbara’s daughter Barbara Collin Donkin when she struck by lightening on the eve of her wedding in 1837, this line particular branch of the Carnaby’s would die out as non of his other Carnaby cousins left issue. William noted the event in his dairy entry July 24 – 30th. Ralph and John Carnaby didn’t marry, and being a prosperous farmer and lawyer respectively, it may not be too uncharitable to speculate that Mr Brewis had his eye on a share of the ‘pot’. Ralph died at Shawdon Woodhouse on 13th July 1842 and again the event is noted in his diary. ​Died on Wednesday last our Friend and Cousin Ralph Carnaby Esq, of Shawdon Wood House a very stout and gross made man I should say nearly 20 stones but a real worthy character. A man I should say, never did ill to no person, but a good natured peaceable person long steward for the Hargreaves family of Shawdon, and I should say by them much regretted, he has left only brother John who was an attorney some time in Morpeth … R Carnaby formerly lived at Todburn who was born then his father James Carnaby married my mother’s younger sister they farmed Todburn, Hedley Wood and the West Field near Rothbury before they left for Shawdon … the only surviving of the family is John, a very quiet and inoffensive man but not brought up to Farming, consequently he will leave the place on May first and retire to some quiet place to spend the remainder of his days. His account would infer that James Carnaby and his mother’s sister married after Ralph had been born, however, this is not the case as they married at Mitford in 1768, some 4 years before Ralph’s birth in 1772. Although Mr Brewis is a blood cousin through the female (Hair) line he is remiss in failing to remember that Ralph and John Carnaby did in fact have another close Carnaby blood relation, the son of a first cousin, John Aynsley of the Chirm, by the marriage of their aunt Mary Carnaby (sister to James) to Lionel Aynsley. ​At his death in 1842 Ralph’s estate was valued at circa £9,000 an estimated £988,444.67 as of 2018. As it happens, the executors of his will John Crea, surgeon in Glanton and Michael Carr of Titlington Mount and all bequests made by Ralph, other than to his brother John appear to have been made to parties with whom there is no known familial connection; Dorothy Crea spinster, an annuity of £80 so long as she remained unmarried; Michael Carr a legacy of £100; the unmarried daughters of William and Barbara Boak (decd) freehold property in Rothbury, (possibly that which was purchased in 1682 from John Gibson), the residue of his estate he left to his brother for his lifetime. Not an Aynsley or Brewis in sight! ​John Carnaby died at Whittingham 7th February 1849 and it is perhaps the diary entry relating to this and subsequent events which is most telling of all. Died at Whittingham on Wednesday 7th February John Carnaby Esq our cousin …it is said he has left his property which is said 15 or 20,000 to Dr Trotter of Morpeth, should it be so, it is said he was not capable of of making his will but the Dr had haunted him him to settle his affairs upon the Hargreave family of Shawdon, how that may be time will determine, he has no relative but our family and more strange, never sent word that he was dead, or invited to his funeral!!! ​An entry in Week 22 is even bitterer. An alarming and destructive fire took place at Shawdon Hall, the seat of W Pawson Esq on Sunday last… But the Hand of Providence is sure and retribution cometh in due time, the family of Dr Trotter and Mr Smart of Sunderland swindled our family of the cash and goods belonged our cousins Carnabys effects!!!! ​Ooooh feel the burn! 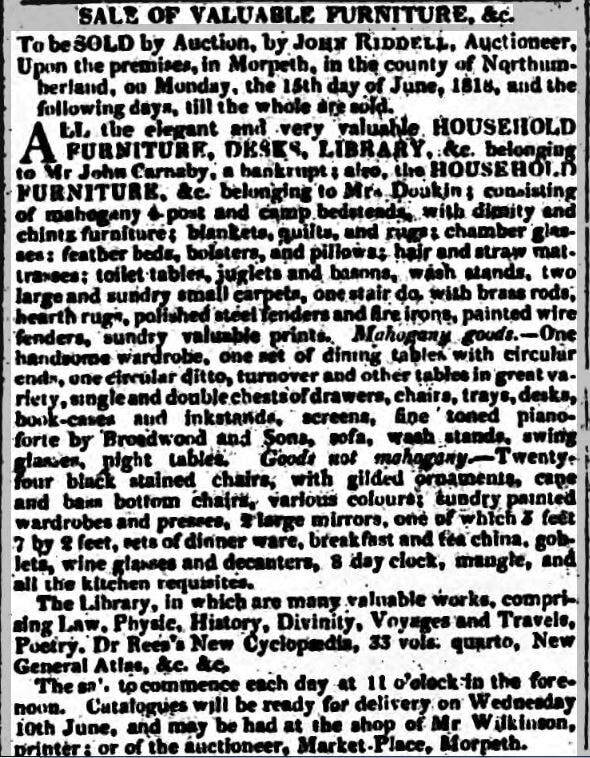 John Carnaby had in fact been declared bankrupt in 1818 and the sale of his goods and chattels indicates he had enjoyed a good standard of living. ​Despite bankruptcy John Carnaby left an estate worth circa £12,000 at the time of his death in 1849. His will does make somewhat complicated reading, as it includes two codicils in favour of the Trotter, Pawson and Smart families as William Brewis suggests. In the original written shortly after his brother’s death in 1842 he does, however, remember his family with the first two bequests being; Thomas Brewis of Angerton (a nephew of the diarist), a freehold dwelling house in Rothbury and the sum of £500 and John Aynsley of the Chirm, the sum of £500. ​It is from here on that his wishes become somewhat convoluted and complicated; William Trotter (Dr) the sum of £1000 and Robert Smart of Bishop Wearmouth the sum £1,000; the residue of his estate in equal share and proportion to William Trotter and Robert Smart, subject to the payment of £2,000 to ‘selected’ creditors under his bankruptcy agreement of 1818. Codicil One adds £300 to relatives of his sister Barbara’s husband Edward and Robert Donkin in satisfaction of a bond. It is dated soon after the original will in 1842 which in all other respects remained unaltered. ​Codicil Two is dated just a few weeks before his death on 25th January 1849. In this second codicil he bequeaths to; Adam Pile of Whittingham, Innkeeper £50; Elizabeth Pile his wife £50; Ann Pile spinster £50; Mary Ann Pawson, (nee Trotter sister of Dr Trotter) wife of William Pawson of Shawdon Hall Esq £1,500; Mary Trotter of Morpeth spinster (niece of Dr Trotter) £1,000; Elizabeth Aynsley, Sarah Aynsley (several possibilities but none confirmed) and Ellen Elsdon (niece of Adam Pile, Innkeeper), John Pile and George Pile £10 each; Mary Ann Pawson and Mary Trotter ‘aforesaid’ all the household furniture and effects from his house at Whittingham. ​Mary was brought to England where she was raised by her uncle the doctor. In November 1855 she married Richard Welch Hollon a Drug Merchant and moved to York where her husband became Lord Mayor of the City in 1864. 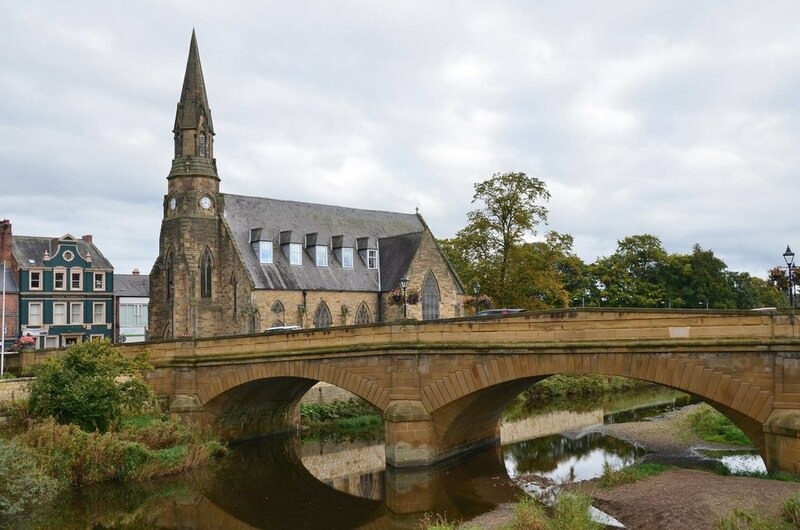 However, Mary never forgot the people of Morpeth and in 1860 she donated the three clock faces that adorn the steeple of St George’s Church in memory of her uncle Dr Trotter and her grandfather the Reverend Robert. ​She died at York in 1880 aged 55 and in remembrance of their happy marriage and love for Morpeth her husband Richard established a fund to provide an annuity of £10 and a tonne of coal to 25 Morpeth residents over the age of 60. 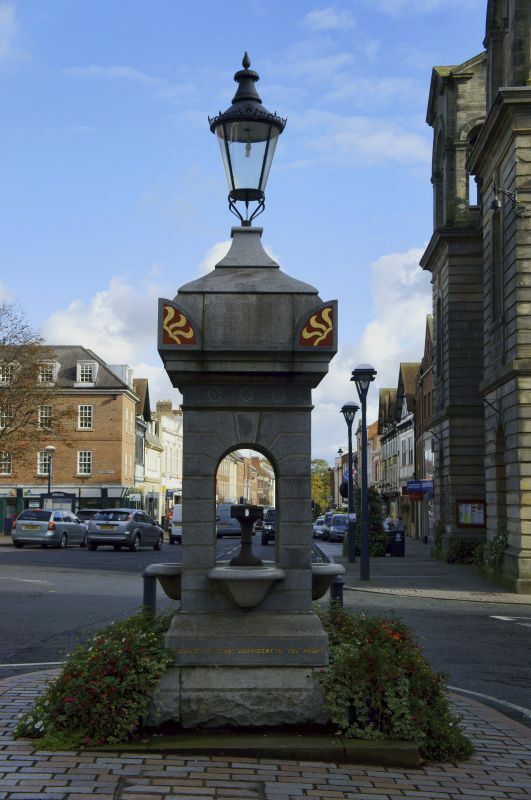 In April 1885 a drinking fountain was erected on the site of the old market cross in her memory and to mark her husband’s generosity to the town. The ‘Hollon Tea’ as it has become known still thrives today. It is celebrated each year on the 5th November, the anniversary of Mary and Richard’s marriage. In 2018 over 80 Morpeth residents over the age of 75 enjoyed the ‘Hollon Tea’ and received their traditional cash annuity. It would be nice to think that these generous and charitable attributes were recognised by John Carnaby when he wrote his will, and that in some small way his legacy, as well that of Mary and Richard Hollon, lives on through the annual ‘Hollon Tea’. A far cry from the resentment recorded by the diarist at the time of John's death, but rather a lasting legacy indeed. 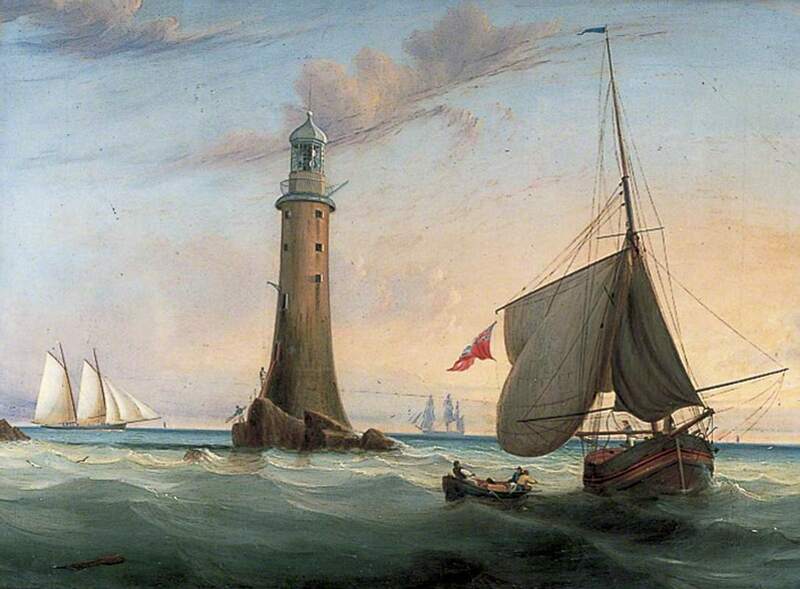 John Lynn - Smeaton's Eddystone Lighthouse. ​Every family has its legends, some prove to be true whilst others turn out to be utter fiction and mine is no exception! Amongst the family papers is a small book ‘The Diaries of Harriett Newell’ published in 1817. 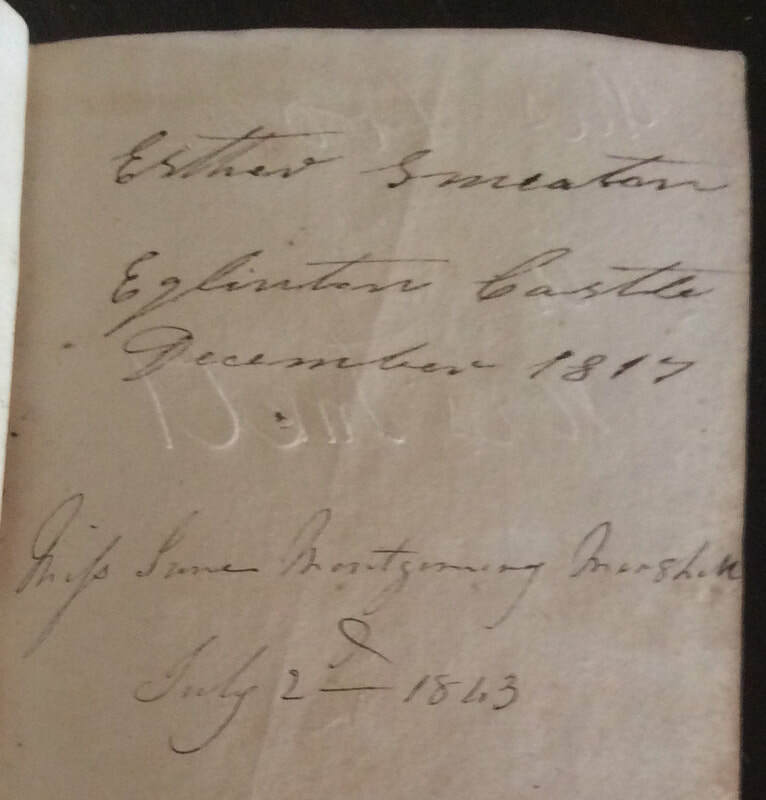 Inside the cover is a handwritten note ‘Esther Smeaton, Eglinton Castle, December 1817’ and underneath in the hand of her daughter is written ‘Jane Montgomery Marshall, July 2nd 1843’. Now legend has it that Esther was a relative of the famous engineer John Smeaton of Eddystone Lighthouse fame. Intrigued and it has to be said somewhat sceptical I decided to investigate. 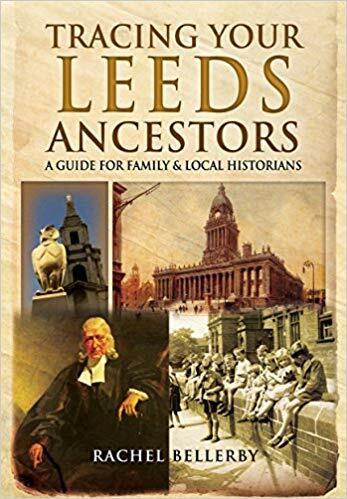 John Smeaton of Eddystone fame was born in 1724 at Whitkirk near Leeds in Yorkshire, the only surviving son of William Smeaton, a local attorney, born Kirkgate, Leeds in 1684 and his wife Mary Stones. John’s biography states his grandfather, who was a watchmaker, moved from York and built the family home of Austhorpe Lodge in 1698.​Esther Smeaton by contrast was born in 1786 at Stichill, Roxburgshire. The extended pedigree and Arms of the Smeaton family of Whitkirk appear on page 60 of the ‘Records of Whitkirk Parish’ and prove the family’s lineage there as early as 1682. There are no apparent links with Scotland and no apparent familial connection whatsoever. So just where and when did the family legend originate? ​Esther was the youngest of six children born to parents John Smeaton and Elizabeth Hamilton born at Stichill. ​From the Stichill and Hume parish baptisms and marriages the Smeaton family have a line which can be traced back here into the mid 17th century too. However, by the time of the 1841 census no Smeatons can be found in the parish of Stichill, with only a Janet Smeaton and her son William at Coldside Farm in the neighbouring village of Hume in Berwickshire. The last entry in the registers is dated 1830. The lack of death records for the parish of Stichell and Hume makes it difficult to eliminate children that may have died in infancy. Here I must thank my friend and colleague Fergus Smith of Old Scottish for looking up the memorial inscriptions at Stichell which have been crucial in unravelling certain members of this family. ​What appears to be Esther’s brother George married a Janet Marshall daughter of George Marshall, a merchant of the Eastend of Hume and his wife Catherine Henderson. Together George and Janet had at least the following children, born in Hume, Berwickshire but recorded in the Stichell, Parish Registers, in Roxburghshire with which the Church of Hume was joined. Catherine b. 1808 died 1819 buried at Stichill with her grandfather. William b. 1819 later of Coldside Farm. 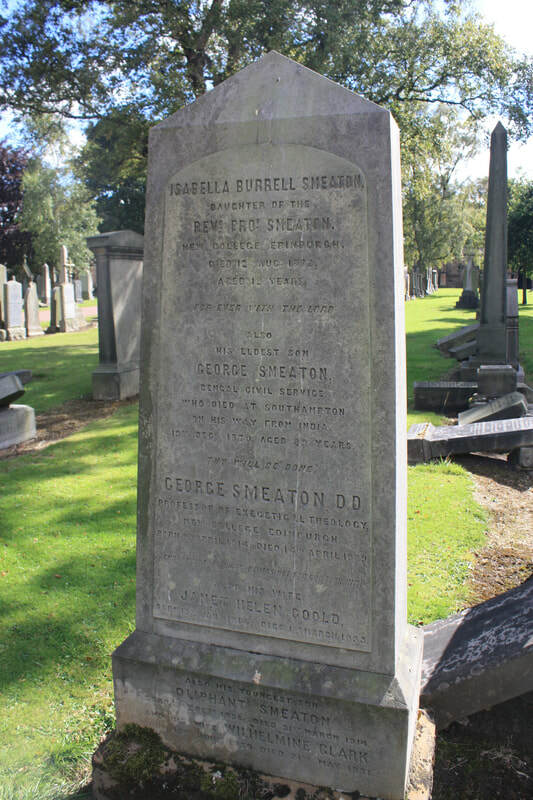 George Smeaton (1814-89) was born in Berwickshire, studied at Edinburgh University, and was ordained to the ministry of the Church of Scotland at Falkland in Fife in 1839. He was among those hundreds of ministers who came out at the Disruption in 1843 to form the Free Church of Scotland, and later that year was inducted to Auchterarder Free Church. He was appointed to the Chair of Divinity at the Free Church College in Aberdeen in 1853, and in 1857 became Professor of New Testament Exegesis at New College, Edinburgh, holding this post until his death in 1889. His works on the atonement for which he is best known – The Apostles’ Doctrine of the Atonement and Christ’s Doctrine of the Atonement – are published by the Trust, together with his The Doctrine of the Holy Spirit. George, or at least the biographer who researched him for Fasti Ecclesiae Scoticanae, believed the family legend was true. ​So far as can be determined this familial relationship is impossible as the John Smeaton of Eddystone fame had no brothers. His father William did have a brother John who died at Whitkirk in 1743 but no issue from his marriage is indicated in the family pedigree. 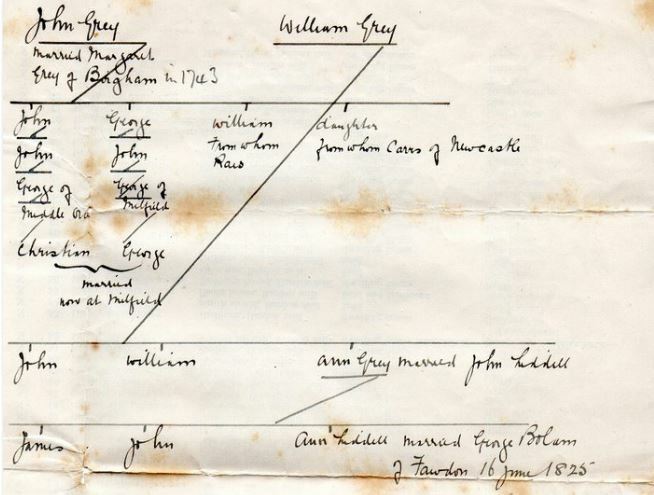 For the familial connection to be true, George’s grandfather would have had to have been the son of John died 1743 above which he is not. He appears to have been born to John Smeaton and Margaret Shiel at Stichill in 1736. ​He left for New Zealand in 1878 where he taught school for several years. Smeaton then travelled to Australia where he spent ten years as a journalist before finally returning to Britain in 1893. Moving to Edinburgh, he began writing about Australian life and literature for various publications in Victorian Britain, including a multi-volume effort popularly known as the "Famous Scots Series". He also began writing several adventure and children's fiction novels such as By Adverse Winds (1895), Our Laddie (1897) and A Mystery Of The Pacific (1899). ​George junior’s sister Elizabeth (Betty) married first a William Henderson of Auchterader at Stichill and Hume in 1830. She married secondly a George Clark of County Down, possibly in Ireland as it was there that their eldest child, Janet Marshall Clark, was born in 1842. Her husband George died on 3rd December 1864 at Rostrevor, Killkeel, County Down, following which the family was once more on the move. This time the destination was New Zealand where youngest daughter Wilhelmina married her cousin Oliphant Smeaton in New Zealand in 1878. Elizabeth died at Queens Street, Thames New Zealand on 3rd June 1884. The familial connection was confirmed by her obituary in the newspaper. 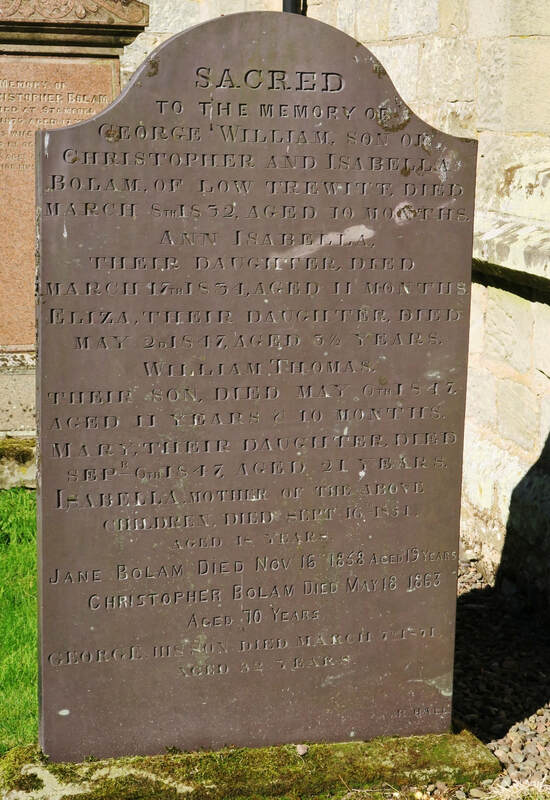 ​Brother William born 1819 remained at Coldside Farm and appears to have died unmarried at some point after 1861. The Farm of Coldside was advertised to let in 1862 and William is named as the current tenant, but no death record has been identified for him to date. 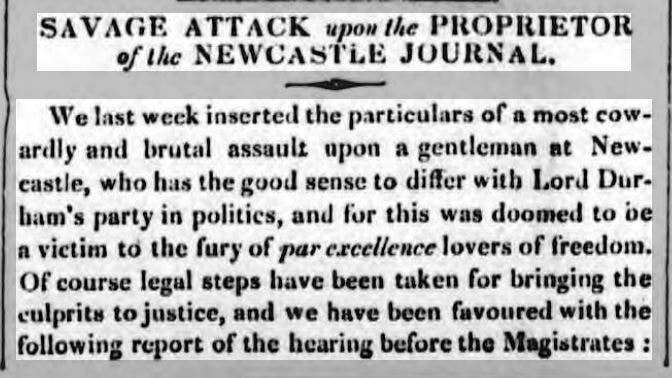 Then we come to eldest brother John who also seems to claim the same relationship as his brother George as evidenced by this article that appeared in the Scotsman in 1827. ​In 1844 a case was brought in front of the Court of Chancery between George Smeaton for his brother John and William Marshall likely to have been his uncle. ​In 1827 Esther Smeaton (the original owner of the book) married John Marshall a tenant farmer of nearby Fallside Hill. In 1828 their only child, a daughter, was baptised Jane Montgomery. Esther died in 1834 and in the 1841 census, Jane aged 13 and her father can be found living at Fallside Hill with a Mary Thomson aged 14 and Helen Cameron aged 30. Her father John died in 1842 and Jane went to live with her unmarried paternal aunt Janet Marshall with whom she can be found in Wester Row, Greenlaw in 1851. She married John Smith of West Chevington at Durham in 1858 and died in 1860. She is remembered on the family memorial stone in Norham Churchyard. It is through this marriage the book came to be in our family’s possession. In 1863 John Smith married again and the rest, as they say, is history. Was the familial association dreamed up by the young Smeaton’s father to inspire them? We shall never know but the legend has endured to this day. The reason why Esther was at Eglinton Castle in 1817 remains a mystery and as no records for Smeaton can be found in Ayreshire it will likely remain so. ​It’s not everyday you stumble across the occupation ‘Parliamentary Reporter’ in the 1841 census, let alone one that was born in Berwick upon Tweed. Intrigued, I set off to retrace his life’s journey. A memorial of his career written in 1883 described him as ‘A big burly man, possessing a burly mind … he died after a hard working life which he commenced as a journeyman painter at Berwick on Tweed’. ​Shortly afterwards the family moved to Salford, Lancashire where daughter Isabella was born in 1836, closely followed by a son Robert Owen Fleming in 1838 and herein lies the clue. Born on the 14th May 1771, in Newtown, a small market town in Wales, Robert was the sixth of seven children born to the local saddler and ironmonger. He was an intelligent boy who read avidly, loved music and was good at sports. He began his career in the textile industry early on, from around the age of 10. By the time he was 21 he was a mill manager in Manchester. His entrepreneurial spirit, management skill and progressive moral views were emerging by the early 1790s. In 1793, he was elected as a member of the Manchester Literary and Philosophical Society, where the ideas of reformers and philosophers of the Enlightenment were discussed. He also became a committee member of the Manchester Board of Health which was set up to promote improvements in the health and working conditions of factory workers. Meanwhile, in Scotland, New Lanark Cotton Spinning Mills were being established. This enterprise was to prove pivotal in Owen’s career as a businessman and social pioneer. 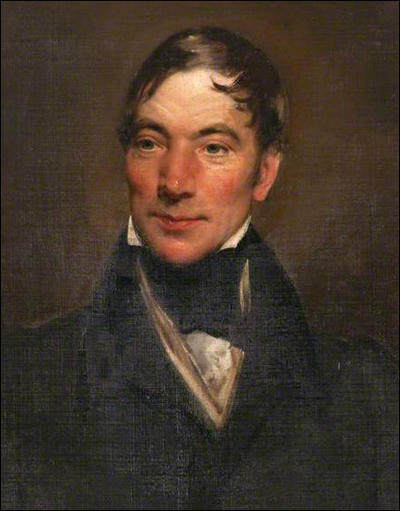 Robert Owen (c. 1825) Henry William Pickersgill RA. Manchester and Salford displayed vibrant support for Owenism the Salford Social Institution, a large meeting place for the local Owenites, and the first in the country, was opened in the late 1830’s. George Alexander Fleming was active in the early co-operative movement in Salford, including the Salford co-operative store and the co-operative school. He was instrumental in the founding of the Salford Community Association in 1836. Fleming was later prominent in the Association of All Classes of All Nations, and was editor of the New Moral World, and later of the Moral World. After the end of the Owenite movement, he was involved with the League of Social Progress and the Co-operative League. (John C Langdon) DPhil University of York, 2000. It would have been around this time as the Community Association’s secretary that he wrote and delivered a lecture entitled ‘The Infidelity of the Professed Church or, The Church and Competitive Society Tried By The Bible And Convicted’ at the Salford Social Institution. By the time of the 1841 census George was firmly entrenched in his journalistic and literary career and living with his family at Alfred Place in Leeds. 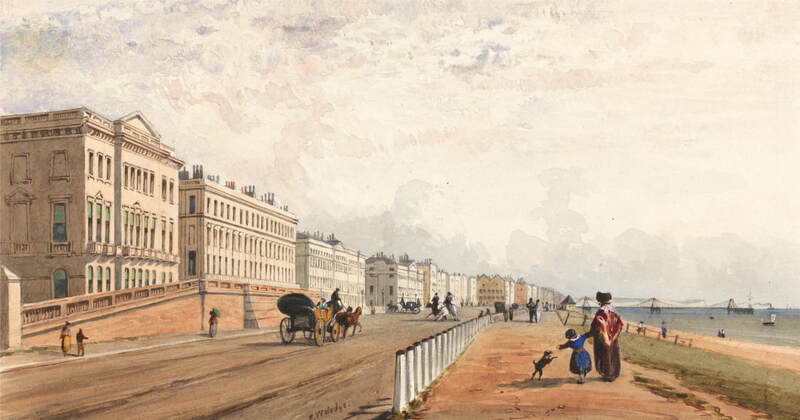 By 1842 he had moved to London where his youngest daughter Emily, (another colourful character) was born. An obituary which appeared shortly after his death in 1878 reflects an interesting, varied and principled life. ​It is interesting to note that whilst he would be ‘missed by a large circle of friends’, no mention is made of a widow or family. Together with his wife Isabella Gray, the couple had 6 children, 3 boys John, Robert Owen, George Alexander jnr and 3 girls; Isabella, Jane and Emily. George’s wife Isabella died in London in early 1861 and by 1871 George, a widower and three of his unmarried children had moved to Carlton Terrace in Hastings where this curious notice appears in the press. ​Is it possible his family was bleeding him dry? Certainly by the time of his death in 1878 in London his estate was valued at under £200 and he had acquired a wife for whom no marriage, or any other record for that matter can be found! ​I suspect his Will may make interesting reading! Are you related to this extraordinary man or the elusive Anna Maria Lovelace? - if so we would love to hear from you. 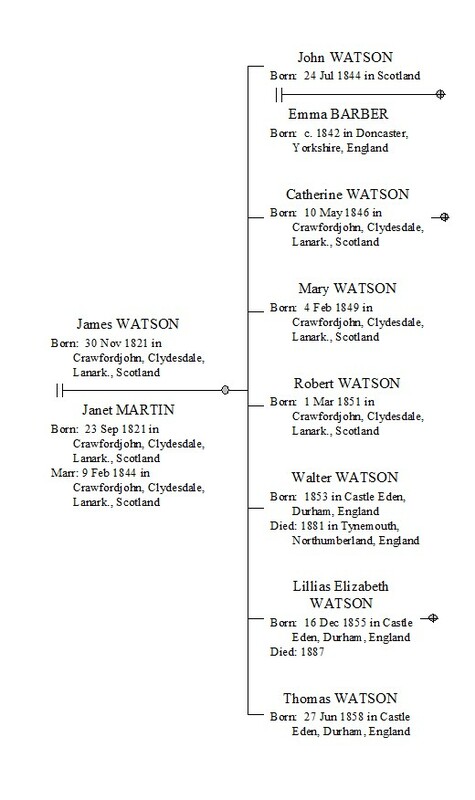 ​My Watson family ancestors have had me somewhat perplexed, hence to date I have not written of them before. As a researcher I have witnessed many oddities and irregularities, but I have never had an ancestor rise from the dead before! Could it be that a simple error of name in a register of deaths has been the brick wall for so many years? 'Success' Samuel Waller 1881, copyright Tate Gallery, Creative Commons CC-BY-NC-ND (3.0 Unported). Before now the earliest point of absolute certainty with my Watsons is the marriage after banns of a John Watson to Emma Barber on the 8th January 1870 at St Georges, Camden Hill, in London. John, aged 26 is recorded as a groom and living in Dorset Cottage, and gives his father’s name as James, occupation Farmer. Emma, aged 28, of no occupation was living at 7 Stanley Crescent and gave her father’s name as William, a Coachman. They were both a long way from home with Emma having been born in the December quarter of 1841 in the West Riding of Yorkshire, and John in 1844 in Crawfordjohn, Lanarkshire. That Emma is my 2x great grandmother is beyond doubt as all the DNA testers in this line of my family have inherited a generous dollop of Barber blood with several strong matches to descendants of her siblings. The same is not the case with the Watsons, with matches to known descendants of John and Emma being way too small for given their relationships casting doubt over John Watson’s paternity of certainly one of her children, that is until now. A new match has appeared suggesting that John Watson is both my 2x great grandfather and 2x great uncle through a bigamous marriage to Caroline Smith at Cheltenham in 1866. Even though John is a bit of a slippery fish I don’t believe this to be the case, the match of only 8 cMs is just way too small to be any closer than 3rd cousin. If I had not seen the link to Crawfordjohn a tiny place in Lanarkshire, I would probably have written the match off as an error in the tree. ​Emma, who suffered a similar rollercoaster of fortunes akin to Thackeray’s Becky Sharpe, was clearly not in a position to be living on her own means at 7 Stanley Crescent. It is possible she followed her brother Oliver to London, where he was studying to become a surgeon at University College and living in lodgings in Camden Town in the 1871 census, or her brother William a Grenadier Guard and a patient in Rochester Row military hospital the same year. Indeed all the Barber children forged careers and marriages that would appear to have been somewhat above the station for offspring of a Coachman! Emma appears to have been the Black Sheep. Following her marriage to John the couple moved to Newcastle and in 1871 can be found at Seaton Burn House, with their first child James born in December 1870. John is now Coachman to Joseph Snowball and although he and Emma have a further seven children, it is the last we see of him. In the 1881 census he has been replaced as the Snowball's coachman by a Thomas Robson and Emma is living with her children in a tenement block in Longbenton, a coachman’s wife and married. Of John there is no sign but he appears to have died in the subsequent inter-census period as by 1891 Emma and her family are living at 22 Gainsborough Grove and she is described as a widow. John’s death has not been found to date as there are simply too many possibilities. Emma is last sighted running letting apartments in Cambridge Avenue on her ‘own account’ in Whitley Bay in 1911. No date or place of death has been found for her either, as it would appear to have taken place outside of Newcastle and district. John Watson was born on the 24th of July 1844 and baptised at Crawfordjohn to parents James Watson and his wife Janet Martin. 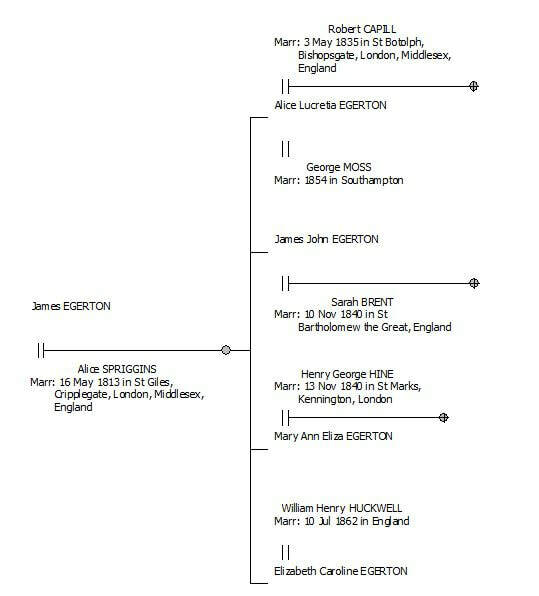 This has now been confirmed through DNA matches to descendants of Janet Martin's siblings, and others from Janet's maternal Ewart line. I believe that John Watson husband of Caroline Smith was born in Crawfordjohn in March 1845 to parents John Watson and Jane/Jean Newbigging. The DNA match would indicate that the two Johns may have been related, the question is how. In 1851 James and Janet are farming 10 acres at Meadowbank, Crawfordjohn. Between 1851 and 1861 they had moved to Castle Eden in Durham. Births of subsequent children proved the mother’s maiden name to be Martin whom James had married in February 1844 when obviously pregnant with John. 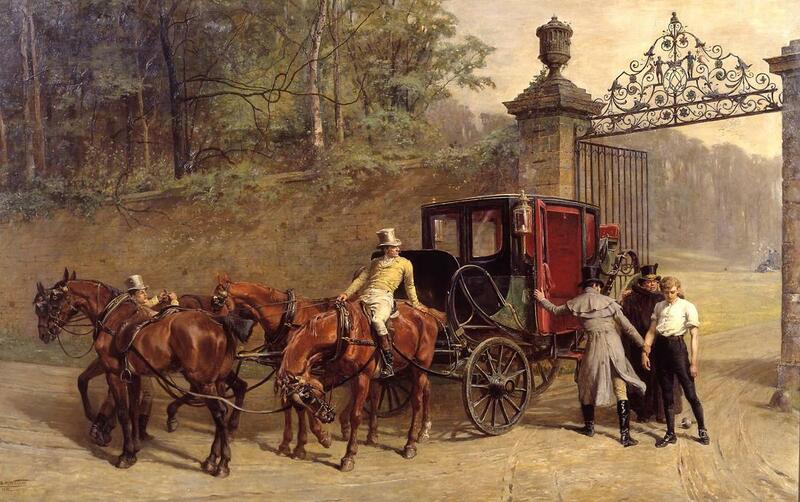 In 1861, his father James is described as a Countryman and son John a Coachman. James and Janet had moved to Cullercoats by 1871 with the last known address for James being Coxlodge, Gosforth in 1891. In the 1851 Scottish census James aged 29 gives his place of birth as Sanquhar, Dumfriesshire but no corresponding baptism can be found for him there for the corresponding period. 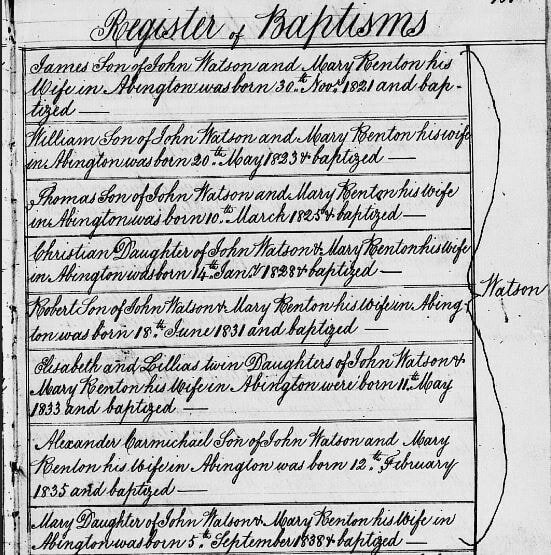 However, all the children of a John Watson and Mary Renton of Abington were entered in the Crawfordjohn Parish Register en-masse with dates for births but no date or place of baptism is given. ​This particular family of Watsons had interests in various places in both Lanarkshire, Dumfriesshire and Dalry, Kirkcudbright, so it is highly possible that James was born at Thornhill near Sanquhar in November 1821. A fact happily supported by the 1841 census for Crawfordjohn which shows James and his mother Mary as not born in the county. ​On the 24th of February 1852 James Watson son of John Watson farmer of Millmark died! ​The family grave in Wandell and Lamington although the name is no longer legible gives his age as 26. There is something all wrong about this record as the potential birth year of 1825/26 is five years out. James, son of John and Mary was born in 1821, yet no other James or John Watson can be found at Millmark in the 1851 census. Furthermore, the stones which all lie together in Wandell and Lamington Kirk Yard, indicating it is one family, are obviously badly weathered making many of the details unreadable or incorrect. ​1852 was a bad year for the Watsons in addition to the possible record for James above, John and Mary’s son Thomas died too and was interred at Lamington just 5 days later . Should the Dalry register have read Thomas and not James? 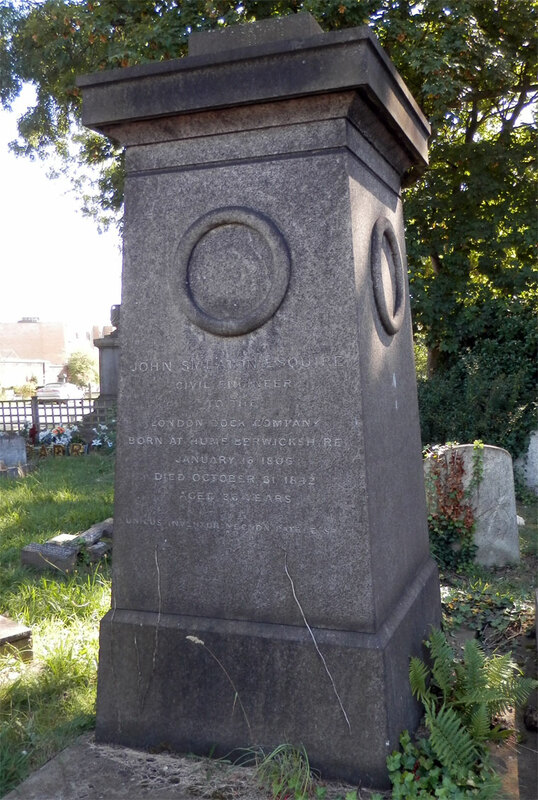 Given his birth date of 10 March 1825, Thomas would have been aged 26 at the time of his death, which would agree with the age given on the headstone. Consumption (Tuberculosis) was sadly rife in this family! It took Welshy a daughter of James Watson and his wife Welsh (also nee Watson) in 1858 and their remaining sons John and James in 1862 and 1868 respectively. 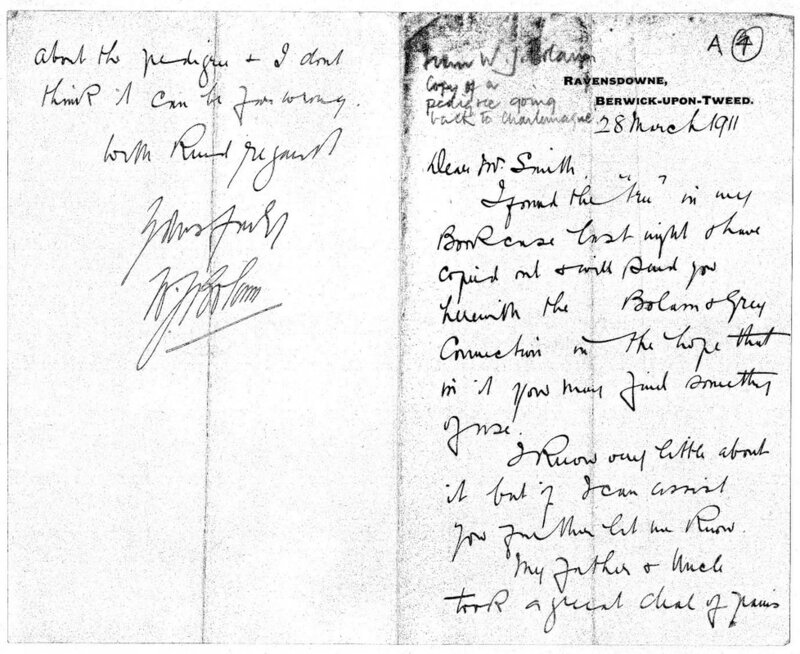 ​At the other end of the spanner, James, son of John Watson and Mary Renton of Milbank seems to have made a remarkable recovery from his fatal infliction as he appears as clear as day in his father’s will which was written in 1864! ​As the will also has a codicil added slightly later if some oversight had occurred it would have been rectified there, but it does not. As it happens it was Alexander Carmichael Watson who predeceased his father by only a few weeks. 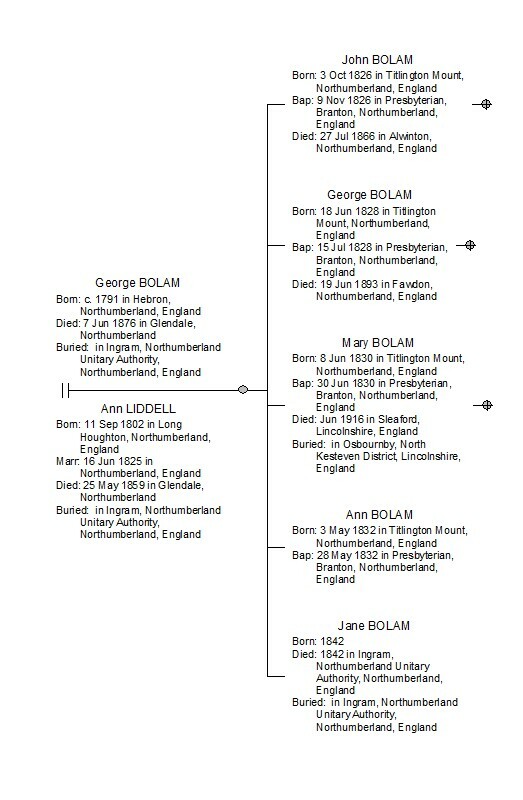 Alexander’s wife Priscilla Bell was a native of Brancepeth in County Durham some 14 miles from Castle Eden, home to John Watson and Janet Martin in 1861. Alexander and Priscilla had married at Durham in 1862. Is it possible that they met through his brother James or married sister Lillias who by 1861 was living in Tow Law? It certainly seems a plausible explanation. Mary Renton died at Walworth Terrace, Glasgow in 1872. From the valuation rolls it appears the farm was vacated by 1875 in accordance with John’s last wishes and Priscilla and her boys had returned to her family home in Brancepeth by 1881. Hoping that David Watson who graduated from Glasgow University as a surgeon in 1863 would hold some further clues, I was frustrated to find he had emigrated to New Zealand in 1870 and his trail has gone cold for now. ​In John Watson’s death record of 1871 his parents are named as James Watson and Elizabeth Barclay, which ties in with the family graves in Wandell and Lamington, the earliest of which belongs to William Watson (1717-1790) and Lillias Simpson (1721 - 1795). 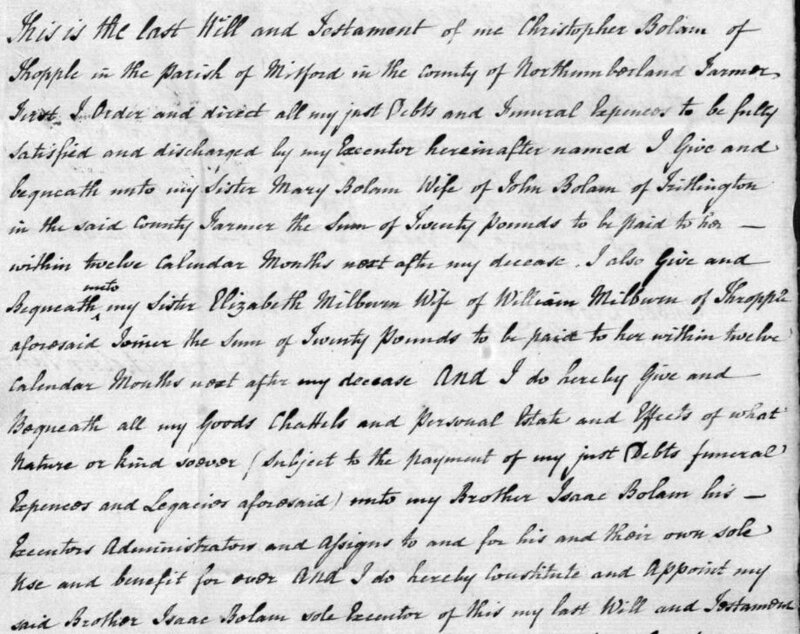 Elizabeth Barclay died in 1835 and husband James Watson in 1843 - he too left a detailed will. At the time of his death he was residing at Southwood, a farm also associated with William Watson above. In it he refers to houses and yards in Linton, Peeblesshire (possessed by son John), a house in Thornhill, Dumfriesshire, (possessed by his daughter Alison McCaig) and names his other children as Welshie Watson wife of James Watson of Abington, Lillias Watson wife of Louden Cranstoun in Abington and his youngest son James with whom he is joint tenant of the farms of Castlemain of Crawford and Southwood. Finally, James makes a bequest of £200 to a grandson James Hunter, the son of his deceased daughter Elizabeth. ​Something a bit different for Borders Ancestry readers this month. As some of you may be aware I am a bit of a Flodden ‘geek’ but far from the military tactics, political backdrop and the auspicious persons that took part in the Battle of 1513, my interest lies more in the logistics of feeding the English army of circa 20,000 men, their followers and the impact on the lives of ordinary local people. As part of local, rather than family history research the latest rabbit hole I have disappeared down concerns corn and corn production in the early sixteenth century in the area of the English Border with Scotland. Historians seem to be particularly fond of saying ‘The northern Marches were obviously incapable of meeting a sudden demand for the feeding of 20,000 men’. Needless to say this ‘incapability’ is often blamed on the Anglo Scottish Wars and the nefarious activities of raiding parties from both sides of the Border. However, studies to date tend to focus on the macro issues of victualling a peripatetic army during either the period of the Anglo Scottish Wars 1297 – 1603 or the Tudor period from the accession of Henry VII in 1485 rather than the micro level at the time of the Battle. Whilst these ‘raids’ undoubtedly had a significant impact on the local communities, were there alternative reasons that would restrict corn production in the Border Region in the early sixteenth century, if indeed it was restricted at all? The type of farming practised, crops grown, topography and climate perhaps? Furthermore, Flodden took place after a period of relative calm in the Border region following the signing of the ‘Treaty of Ayton’ in 1497 and ‘Treaty of Perpetual Peace’ in 1502. It was not until Henry VIII declared his intention to invade France that rumblings of disquiet once again threatened ‘international’ relations along the Border in 1512. Has the ‘historians’ fondness of portraying the North as a barren and inhospitable landscape occupied by lawless barbarous people been somewhat over exaggerated? The type of forays practised in times of ‘war’ were in the manner of retaliatory Chevauches or ‘short sharp shocks’ which were high localised. They generally involved the destruction of crops and stores by fire and the leading away of booty in the form of livestock and other household goods. After isolated incidences of burning (if they did indeed burn standing crops) the land itself would recover quite quickly, indeed, until it was banned in the UK in 1993, the residual corn stubbles were often burned as it ; quickly clears the field and is cheap, kills weeds, kills slugs and other pests and can reduce nitrogen tie-up. ​Other oddments appear elsewhere which include a payment of £81 to the Mayor of Newcastle (John Brandling) for food ‘spoyled stolen and destroyed’ and a note of debts to Allen Harding of Newcastle and Richard Gough again in 1514. 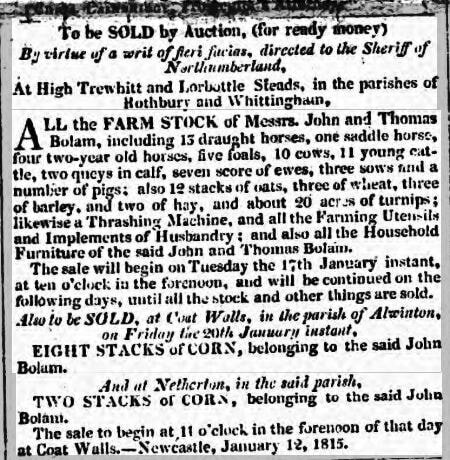 This indicates the potential commercial interests of the merchants, guilds and the Corporation of Newcastle, which suggests they may have had far more involvement in the supply of corn to Surrey’s army than previously discussed in published works. 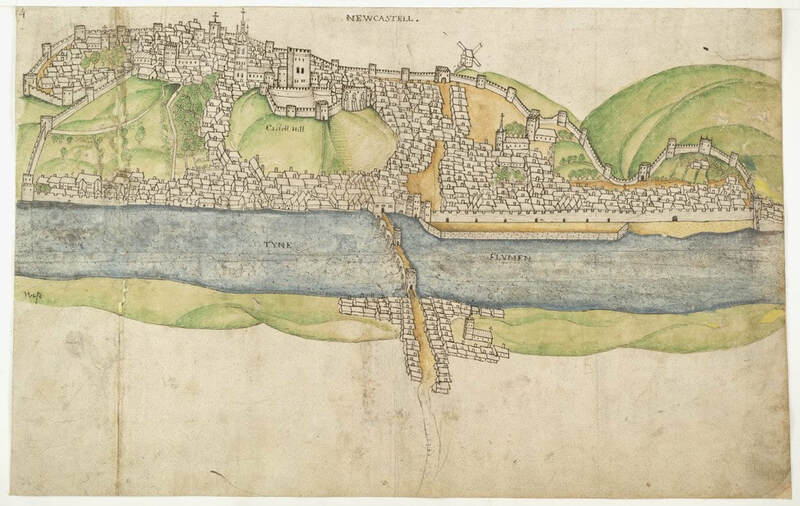 Plan of Newcastle-upon-Tyne thought to date from around 1545 and to have been drawn by Gian Tomasso Scala - Cotton Augustus 1.11.4 copyright of the British Library. ​In search of evidence of an earlier corn trade between Hull and Newcastle, the city’s Chamberlain’s Accounts between 1508 and 1511 which was been transcribed in full by Dr C M Fraser in 1987, copies of which can be bought quite reasonably from the Newcastle Society of Antiquaries. This has been analysed and the figures for corn imports extracted and entered into a database. These are the earliest known surviving record of Newcastle’s municipal records and deals with both revenue and expenditure. Whilst I have to admit that scouring each page line by line over the entire 240 pages of entries has probably been the most tedious part of the research process, the results have been most enlightening. However, they come with the caveat that as the Chamberlains Accounts record the levies and tolls payable by the captains of all non Newcastle ships they are an indication rather than a measure of trade. Indeed it was the ‘measurage’ and ‘portage’ at 4 old pence per chalder payable at Newcastle recorded in the Gough accounts of 1513 that helped identify the weight of a Newcastle Chalder (for corn at least) as approximately 4 quarters. I don’t intend to bore readers with the statistical details of corn imports, which came mainly from the domestic east coasts ports of, unsurprisingly, East Anglia and Lincolnshire and whether or not they support my theory. Instead it is to the wealth of other information contained in Chamberlains Accounts and their potential value to researchers of the life and times of the people of Newcastle and its hinterland in the early 16th century which is covered here. ​The hostmen, who were often also the Burgesses of Newcastle and the coal owners, exploited a custom often used in other cities of 'foreign bought and foreign sold'. This custom provided that any goods brought into the town by a foreigner (either an Englishman or an alien) who was not a freeman, could be bought only by a freeman, and similarly any goods purchased must be bought from a freeman. Thus, in every case of a purchase or a sale, one of the parties must be a freeman. The records are name rich, and amongst their number many will be familiar such as Brandling, Bell, Carr, Ellison, Robson, Ridell, Sanderson, Southern and Thomson. The Master of the ship and port to which he belonged is also recorded which illustrates the extent and pattern of both domestic and international trade of ships entering Newcastle for coal. Inbound cargoes from the Netherlands included apples, wine, herrings, potash, soap, tar, pitch with tiles from Antwerp and onions from Amsterdam to name but a few. From France came nuts, prunes, salt, glass, iron and the occasional loads of corn but the overwhelming incoming cargo and indeed that which dominates the accounts both foreign and domestic is stones! By far the majority of the ships entered Newcastle either ‘empty’ (carrying goods which attracted no levies and therefore not recorded) in ballast or carrying stones. This potentially highlights the importance of the outbound cargos rather than the import of corn and other goods. ​Although no purpose is ever stated for the incoming stones the prodigious number of entries under expenses paid to the Paviour (John Dun) and Masons (numerous) must surely be significant. Maintenance of the roads and bridges was clearly a priority. In the latter entries there are also frequent references to the building of a ‘newhous’. These expenditure accounts are also name rich with many more lowly labourers, messengers, and city gate keepers – William Smith the keeper at Sandgate, Ralph Smith for keeping Westgate – are also mentioned by name no matter how small the service they rendered. Women too appear amongst their number, sometimes listed as ‘wife of’ and others such as Dame Hebbron at White Friars, Wilkinson’s wife in the Cloth Market named as keepers of kilns and bakehouse ovens, and Proffett’s wife for ringing the bell in the Big Market. Gutter cleaning, snow clearing, ‘dightyng ramell fro Pylgramstrett pantt’ (clearing rubbish from Pilgrim St pant) the giving of alms, even to inmates of Newgate Prison, and what appears to be the occasional burial all get a mention. ​The Feast Day of St John the Baptist on 24th June which was celebrated the night before with dancing and copious amounts of wine. In June 1509 the Guild gave a hoghead of wine (63 imperial gallons) to the town (in 1500 estimated to equate to circa 5,000 inhabitants) at a cost of 20 shillings, which does not include the 3 gallons of wine supplied to the major himself at a cost of a further 2 shillings. It appears the dancing ‘affor the mair’ was done by ‘schippmen’ or sailors at a reward of 2 shillings – were these perhaps the colourful keel boat men who ferried the coal from the shore to the ships moored in various streches of the river? There is evidence from the seventeenth century that these ‘Keelers’ were largely comprised of Scots but whether this was the case during the sixteenth century is not known. 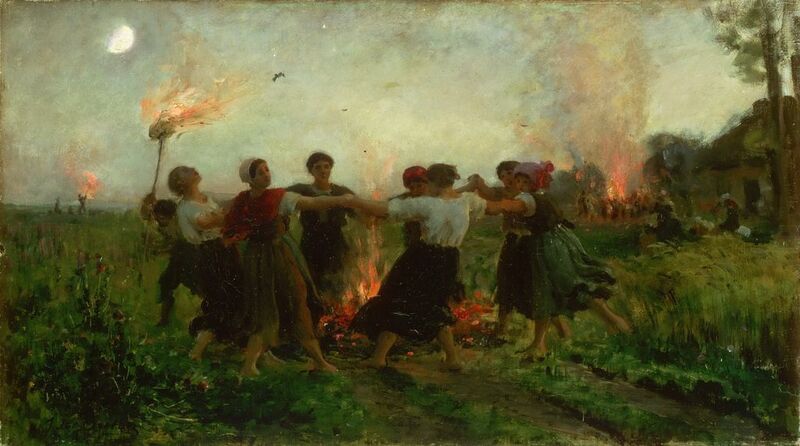 An example of the festivities of St John's Eve which coincides with Midsummer. ​There is also evidence that St George’s Day was observed when in April 1510 materials and labour was expended on constructing and painting a dragon. As the accounts span the death of one monarch and therefore the coronation of another it was somewhat odd to find no reflection of this within the accounts, other than the movement of the ‘great guns’ and ‘clearing the hill’ on the 28th April 1509, a week after the death of Henry VII. Had the guns been taken to a high point such as the Town Moor and fired to let the townsfolk know they had a new monarch? Another occasion when copious amounts of wine was consumed was recorded on 20th February 1511 to toast the ‘triumph of the prince’. If this was a celebration of the birth of Henry VIII’s first son Henry, Duke of Cornwall, born on New Year’s day, it was late - if it was to mark his death it was two days early! 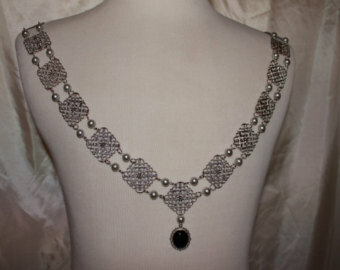 Perhaps the collar looked a bit like this example? ​Whatever the mayor and the town officials did, they did it in flamboyant style, not least in the manner of their dress. In December 1508 an amount of £4 6 shillings was spent on a silver collar for their minstrel William Carr that weighted in at a hefty 16 ounces. This was in addition to expenses for the Mayor’s sword belt made of velvet, a silver gilt buckle and pendant, £11 was spent on the liveries of the town’s sergeants and waits (minstrels), and in January 1509, 9 shillings was spent on 27 grey skins for the mayor’s new hat. It paints a colourful picture with the Corporation and other Town Guilds at the centre of what would appear to be a prosperous and bustling town. What is also interesting to note, is the language in which the accounts are written. It is a definite hybrid of Scots and English, typified by the use of the ‘qw’ in place of a ‘wh’ in ‘wheat’ and ‘white’, the Anglo Saxon yogh ƺ in place of a consonant ‘y’ (the letter ‘y’ was also used as an alternative for the vowel ‘i’ at this time) so the surname ‘Young’ appears as ‘ƺong’. The endings of plural nouns in ‘is’ as in ‘collis’ and ‘dayis’, whereas the English documents favour the single ‘s’ ‘es’ or the equivalent contraction mark, and past tense verbs ending in ‘it’ instead of ‘ed’ e.g. departit instead of ‘departed’ reflect the influence of Latin which is typical of Scot’s documents of this period. In contrast there is no use of ‘and’, typically a Scots ending of the English form of the present particle ending ‘ing’. Extract from the original document, courtesy of Tyne and Wear Archives. ​The Chamberlains Accounts of such an early period might not be at the top of everyone’s reading list, but for the history and customs of the town at the beginning of the sixteenth century it makes rich pickings and is well worth a read. As for the other evidence for corn production in Northumberland and North Durham at this time, other records such as manorial records, corn tithe information, rent payments, correspondence (usually complaints) and inventories attached to wills need to be consulted. However, these can be rather dry when compared to the accounts of the Newcastle Chamberlains. Examples of some early wills and inventories have been transcribed by the Surtees Society and are available online but be warned the early examples are written in Latin. In the words from the film ‘Meet Joe Black’ there is nothing ‘as certain as death and taxes’ but these are records where the information I seek can be found. Victuals meaning food or provisions of any kind. ‘Occasionally applied to food for animals, but more commonly restricted to that of persons’. ‘Peson’ is the archaic word for peas. ​ Peter D Wright, Life on the Tyne: Water Trades on the Lower River Tyne in the Seventeenth and Eighteenth Centuries, a Reappraisal, Abingdon, 2016, p4. 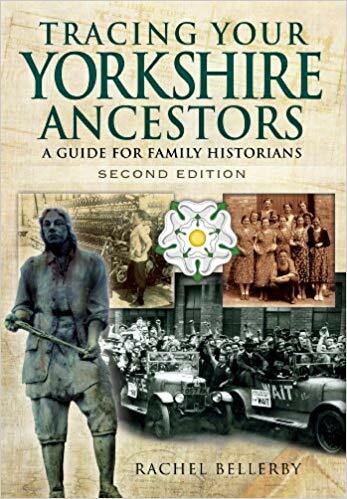 Rachel is also the author of 'Tracing Your Yorkshire Ancestors', 'Tracing Your Leeds Ancestors', 'Chasing the Sixpence' and the forthcoming 'Struggle & Suffrage: Women of Bradford, 1850-1950'. She is also, I am delighted to say, the newest member of the team behind #AncestryHour, which was established by myself back in January 2015, to bring together the world of professional and amateur family history. For an hour every Tuesday between 7 and 8 pm, Rachel, myself and other team members, Sylvia Valentine, Michelle Leonard, Fergus Smith, John Boeren and Tara Frugalone host an hour of quick fire ‘questions and answers’ on Twitter, where we (and many other leading professionals) pop in to share our expertise for free. Since it launched #Ancestry Hour has been quoted as ‘… the most valuable #hashtag on the internet for #familyhistory and #genealogy …’ Long may it continue – if you haven’t already joined in the chat why not give it a go! Rachel’s blog is about ways to give back to the hobby you love, which is very much the ethos behind #AncestryHour. It is also most timely given this is the time of year when archives and family history societies are planning their ‘Heritage Open Days’ and on the lookout for volunteers. Events such as these provide a fantastic opportunity to get involved and connect with fellow history enthusiasts in your area. Volunteering can be a very rewarding experience, and many of the projects instigated by local archives also provide the opportunity to learn a new skill for free. In this respect I am a perfect example, the Flodden 500 Project gave me first taste of the art of palaeography. The Heritage Lottery funded document transcription project led by Linda Bankier of Berwick Archive Office, was the inspiration for me signing up to the MLitt post graduate degree course with Dundee University in September 2015. Document transcription is now one of my specialist skills, and yes, a document dating from 1513 relating to the Battle of Flodden forms the basis of my ongoing dissertation. Who knows where giving up a bit of free time could lead you! Anyway, without further ado, here are Rachel’s top ten tips on how you can get involved – even if you live outside the UK. Many of us lead busy lives and your opportunities to volunteer your time and knowledge at the might be limited at the present time. However there’s one way we can all benefit the family history world and that’s by trying our best to keep our family tree notes and findings organised, and being honest about any information which is open to interpretation, or not yet fully verified. Both your fellow researchers and your own descendants will thank you for a well-organised and carefully researched tree! You can follow Rachel on Twitter at ​@bellerbyrach or you can catch her, and the rest of team on Tuesday's between 7 and 8pm during @ancestryhour.